Receive a free digital meter ($190 - $290 value*) when purchasing one of our industry-standard micro electrodes. Choose between micro pH, micro redox, micro DO or micro ion electrodes. * Type of meter varies based on type of micro electrode purchased. Companion digital meter selected for optimal use with type of electrode selected. Our industry standard micro electrodes have been can measure samples as small as 10 microliters which is less than 1/5 the volume of a single drop of liquid. They can also measure small biological and chemical specimens down to less than 1 mm in length. The probes have tips sizes from 0.5 to 2 mm. Micro pH electrode - FREE digital pH meter with purchase. Micro redox electrode - FREE compatible redox millivolt meter with purchase. 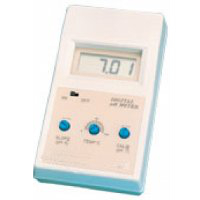 pO2, PCO2 & O2 needle electrode - FREE compatible concentration readout meter with purchase. Micro ion selective electrodes - micro measurement for large selection of ions including Cl, K, Na, F, CN, NO3, SO4, O2, I, Br, S, Ag, Cu, Pb, Cd, Hg, ClO4, Ba, and CO2. Receive a FREE compatible millivolt meter with purchase. The number of free meters is limited to stock on hand. This special offer cannot be combined with any other special sales or offers.